Many people embark on a ketogenic diet in an effort to burn body fat more quickly and efficiently. When the body is in a state of ketosis, almost all fuel comes from stored fat. As such, a ketogenic diet that helps you stay in a natural state of ketosis can help you burn fat and reach your weight loss goals much faster than conventional dieting strategies. But how do you know that you are in a state of ketosis? A ketogenic diet relies on a very low percentage of carbs, a moderate amount of protein, and a high-fat content. Strictly following a keto diet can help your body produce ketones, which is what helps you attain a ketogenic state and therefore burn primarily body fat for energy. But without some sort of meter that can help you measure ketones in your body, you’d basically be guessing where you’re at and may not be at a level that you think you are. That’s why there are devices such as keto breath analyzers, which are handy tools that are designed to provide accurate readings of ketone levels. Simply breathing into these devices can help give you the answers you’re looking for. Keto breath analyzers can help you make the necessary tweaks to your ketogenic diet to ensure you hit that ketogenic state. What is a Keto Breath Analyzer? You’re likely familiar with breathalyzers that law enforcement uses to measure alcohol on a person’s breath. Well, there are also keto breath analyzers that work much the same way except these specialized devices are used to measure the level of ketones in your breath. These are often referred as keto breath meters. There are a few ways to test for the presence and amount of ketones, including invasive blood tests or more simplified ketone test strips that are designed to be dipped in the urine. But keto breath analyzers are much more convenient and easy to use. Just one extended breath into the analyzer can provide you with the details you need to assess whether or not you’re in ketosis. If the level of ketones in your body is ideal for you to reap the fat-burning benefits of being in this state. Although the ketones in your breath are not the same as those measured in the blood, breath ketones can provide you with a real-time indication of how well your body is using stored fat for energy. This is a major advantage over measuring ketones in the blood or urine. Acetone – a by-product of ketones – is produced by the body when it is in a state of ketosis and is used as fuel for the body. Breath analyzers are able to detect the presence of acetone and measure its levels in order to help you gauge whether or not you’re in ketosis and whether your body is primarily using stored fat as energy. This is precisely where you want to be and is what you strive for by following a ketogenic diet. More specifically, if weight loss is your goal, an optimal level of ketosis is around 1.5 – 3 mmol/L. Keto breath analyzers are great for those who wish to measure ketones to target specific benefits of the ketogenic diet. In fact, they are considered to be superior over other forms of measuring ketones in the body. With all the keto breath analyzers available on the market, which ones are considered the best? Here is a run-down of the best keto breath analyzers out there to help make your selection and purchasing process a more streamlined one. When it comes to testing your breath to measure for the presence of ketones, you want an accurate result. But at the same time, you might not necessarily want to have to spend the big bucks. With this ketone breath analyzer from Ketonix, you can have the best of both worlds: a quality product at a reasonable price. This particular breath analyzer can be used over 1,000 times, and it can be plugged into any USB outlet to charge. It doesn’t require batteries, so there’s no need to change batteries all the time. Just plug in and go! Your ketone production will be quickly and easily analyzed simply by blowing into this device. It’s the perfect option for anyone who has adopted the ketogenic lifestyle, as well as a low-carb and paleo diet plan. This is a class I medical device and features software that you can log into in order to analyze your ketone measures. With the data provided, you can then establish your own personal baseline to work from. Measuring your ketone level on the fly is as easy as can be with the KetoIQ Keto Breathalyzer. This product measures levels of ketones through the use of a semi-conductor sensor, which is what helps this product to accurately detect the presence and level of acetone, a byproduct of the state of ketosis. That’s exactly where you want to be! With this breath analyzer, you can find that sweet spot of ketosis, helping you maximize your efforts and burn body fat much more quickly. To analyze your ketones, take the reading displayed on the screen and multiply it by 10 and divide by 2. This will give you your accurate keto reading. The breath analyzer provides a close estimation of your BAC (blood alcohol concentration). This product was specifically designed using an innovative scientific formula to develop an accurate, simple, and affordable way to measure ketone levels. Every breathalyzer sold is sanitized and tested in the US. The company also stands by its products and undertakes in-depth quality control measures to ensure each breath analyzer is top-notch. 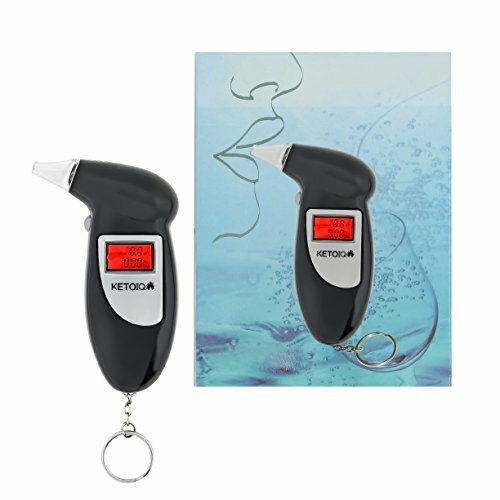 When it comes to buying things like keto breath analyzers, you want to be sure that you’re buying a quality product, and usually this means purchasing from a company of experts. That’s precisely what you’ll be getting with the Keto-Expert Ketone Breath Analyzer & Meter. This keto breath analyzer was inspired and designed by a team of keto experts and enthusiasts, as well as with the assistance of experienced clinical biochemists and dieticians who have come up with a quick, easy, and convenient breath analyzer to help you identify whether or not you’re in ketosis. Maximizing your ketogenic lifestyle has never been easier thanks to this keto breath analyzer and meter. 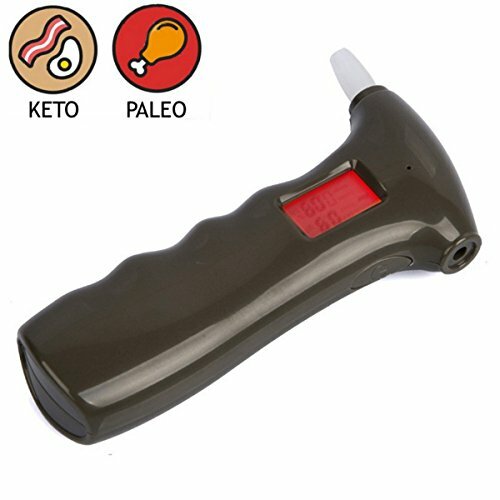 Unlike keto strips, you can use this breathalyzer repeatedly to get accurate results each and every time. It takes less than 30 seconds to get a reading, and there’s no need to plug the device into a computer or smartphone to charge or operate. Thanks to the semi-conductor ketone sensor, you’ll get highly sensitive and specific readouts for ketones and acetone. It’s unique, effective, and provides an accurate reading to help you maintain a state of ketosis and burn body fat around the clock. Following a ketogenic diet can help rev up your fat-burning engine and give you the weight-loss boost you need to achieve an optimal weight and body composition. But sometimes it can be difficult to know if you’re in a ketogenic state without some type of tool to measure your ketone levels. While you can always test your blood or urine, these are more invasive methods that can be inconvenient to use. Instead, keto breath analyzers can provide you with a quick, easy, and effective way to measure your ketones to give you a good indication of where you’re at on your ketogenic journey.